The garden grows and the knitting goes. After some contemplation, I’ve decided to not continue to upload my garden photos to my TypePad album. I already upload them to Flickr and the quality doesn’t seem as good when I upload them to my TypePad album. That said, I’ve uploaded a bunch of pictures to Flickr of the garden today. I wanted to get photos of the garden yesterday, but the sun didn’t want to cooperate with me. I managed a good set of photos today, though. I can hardly believe how fast everything is growing! I have THREE cucumbers growing now, along with three tomatoes that have been growing for about two weeks now. There’s a lot more flowers sprouting up on the cucumbers, tomatoes, and peppers. The Hungarian hot peppers have a third pepper growing now. The bell peppers still haven’t flowered, but when I grew bell peppers before, they were the last to fruit, so I’m not too worried. Over all, everything is doing pretty well. I think the bugs are pretty much gone. I still see a few here and there, but nothing that I’m overly worried with anymore. 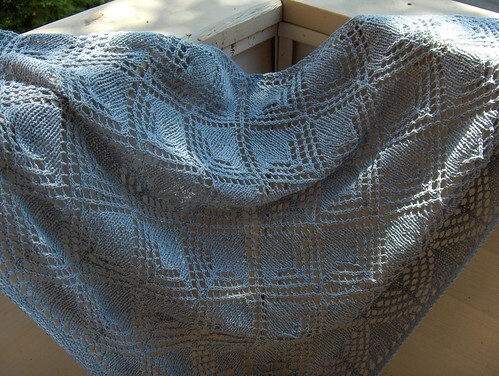 As for knitting, I’ve been working on that SoS ’08 pattern that I talked about in my last post. I turned the heel, completed the heel flap, and started on the leg. I tried it on and I’m just not happy with it. The pattern makes the sock twist, which is all well and good because I figured it would even out once I had the heel done. Yeah, not so much. Still twisty. It’s also a little tight on my foot and hard to keep straight, so I think I’m going to be frogging it. I’m wasn’t really sure about the pattern with the yarn that I was using anyhow. It’s for the best in the end. Still stinks that I’m nearly done with the sock and I am frogging it. Ah, well. It’s better to have socks that I’m going to wear. 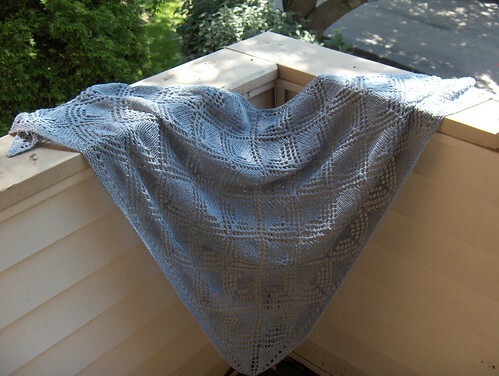 I do love the yarn and really enjoy working with it, so I’m sure I’ll find a pattern that works better with it. I’ve started a new sock, since it is Summer of Socks now. I tried to do Mokey’s toe-up, magic loop style, but the 2.5 mm needle wasn’t working with the yarn. 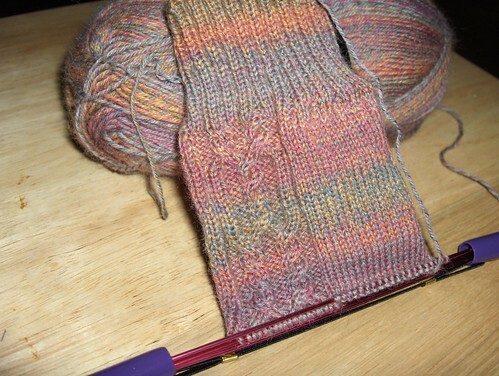 The sock was coming out too big for me, so I frogged the toe I’d done and started it top-down on 2.25 mm DPN’s. I’m doing picot edging, which is a first for me! I like the fabric the 2.25 mm needles are making much better than what I was getting with the 2.5 mm needles. I’m off to go visit with family for a while. Hopefully I can get some knitting time in there somewhere! Knitting, now complete with pictures! Summer of Socks 2008 started last Saturday! I cast-on the pattern Wendy wrote for SoS ’08 on Saturday and I’m up to the heel flap now. This is my Socks That Rock yarn that used to be these socks. liked better. I’m planning on doing toe-up Monkey socks. 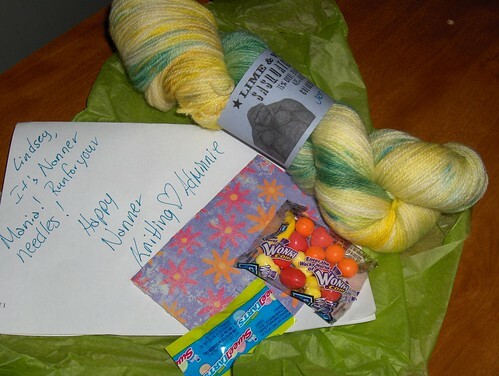 Last Friday, I caved to the nanners and ordered some nanner yarn from Lime & Violet. I have never purchased Lime & Violet yarn before, but have been wanting to since they opened up shop. I’ve been on a “yarn diet” (read: budget) for a while now, so this is a rare treat for me. Now, not only can I knit Wendy’s nanner pattern, but I can knit it with nanner yarn! Have you seen the Twist Collective? I’m sure if you’re a knitter and you aren’t living under a rock somewhere, you’ve probably heard about it. (Don’t feel bad if you haven’t, I’m usually living under a rock and the last person to hear about things. Most of the time, anyhow. Anyway….) I received their email newsletter the other day talking a little more about it. It sounds like it’s going to be really good and I like their set-up for the most part. There’s been some issues with how Interweave Knits is now paying the designers for their patterns and keeping the rights to them. I know a lot of people are upset about the whole thing. Personally, it doesn’t really seem all that fair, and could explain why I’ve been less impressed with their magazine lately. I didn’t even buy the last issue because there wasn’t a single pattern I wanted to knit (seriously, this never happens, there’s always at least two). Anyway, back to Twist Collective. Their magazine is going to be web based and all the articles are going to be free. There’s going to be patterns, but they are charging for each pattern individually. The upside is that most of the money goes back to the designer for each sale. The downside is they haven’t mentioned how much they will charge for each pattern and could end up being a bad thing if you love EVERY pattern in an issue or even a number of patterns because that could end up being rather expensive. It will be interesting to see how that works out, but overall I’m looking forward to the first issue due out at the end of July. I keep meaning to update, but I'm lacking pictures of the garden at the moment. I'll post the photos later and just give you an update for now. The plants are doing really well except for the gnats that I'm still trying to figure out how to get rid of. They don't seem to be harming anything – yet. I am going to see if I can't find some Gnat Stix locally, otherwise I'm going to look into other options. I did see something promising at the garden place near work: Veggie Pharm. If you have any suggestions on how to get rid of these gnats, I'd love to hear them! Anyhow, aside from the gnats, the plants really are doing well. All the herbs seem to be growing good. The Hungarian hot pepper plant has TWO peppers growing on it, but the bell peppers haven't flowered yet (though they are quite big!). The cucumbers have grown quite a bit, flowered and need a cage (or something) now. The patio tomato has fruit! THREE tomatoes are growing on my little plant! I was soooo excited to see them! One of them seems to have something eating at it and I can't decide if I should cut it off, or let it grow. The super bush tomato plant hasn't fruited yet, but has flowered. I think the impatiens are doing well, but since I'm not familiar with growing them, I can't tell. They have lost some flowers, but it still seems good overall. I'll be SO happy when the cicadas go away. They totally gross me out. They were in full swing a week or so ago and swarmed the balcony making it nearly impossible for me to go out there without totally freaking out. Most bugs don't bother me that much, but these ones certainly get to me. Despite my fear of them, I cleaned up the balcony. There were many dead ones cluttering everything up, so I put on my braveness and swept them up. On the knitting front, I've been working on a sock out of Trekking XXL. I've been making up the pattern as I go and so far I like the results. I figured out how to make a chart in Excel and I'm considering writing up the pattern when I'm done. I'll share a photo when I can figure out a way to take a decent one that shows off the yarn and pattern well. I started Icarus on the 14th. I'm trying the pattern again with a solid yarn. 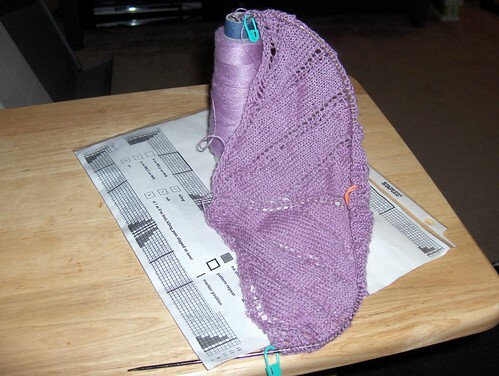 I'm using Zyphr wool-silk 2/18 in a light purple (lilac?) color. I think it's going to be really nice when I'm finished with it. I've nearly knit up to the part I was before when I did it with the multicolored yarn. Seems to go pretty quickly when I work on it, but it hasn't seen much action in the last few days because Summer of Socks 2008 started on the 21st! I'm knitting a sock out of some yarn that I purchased last week when I visited Knitters Mercantile. I'm using the pattern Wendy wrote up just for SoS '08. So far I really like how it's coming out. It's my first time really doing toe-up socks. I've tried before and it's never really worked out too well. 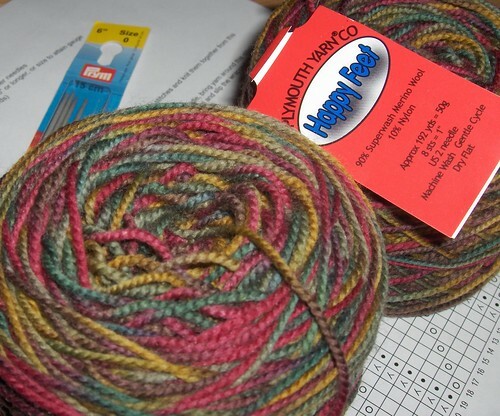 I'd mostly given up on ever trying it again, but I decided that one of my goals for SoS '08 was to try toe-up socks on DPNs and circulars. 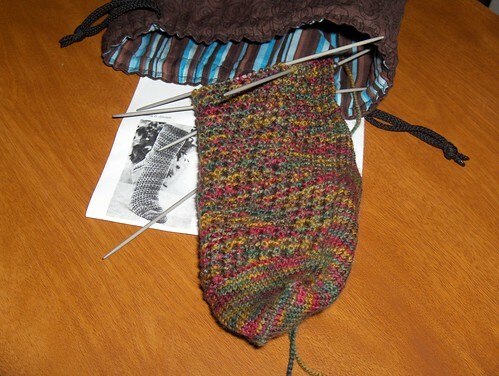 I might even try two at a time toe-up if I really like doing toe-up socks on circulars. (Photo of sock in progress soon!). I finished that hat I talked about last time. I don't like it for me, but I'll complete the band and get a button on it anyway. Photos when that gets done! Aside from all that, life has been moving right along. I took a little trip to Columbus, Ohio with Matt recently because he had a training class to attend there and I decided to go along. I had a good time. We went to a fantastic restaurant – Jason's Restaurant and Bar. My goodness the food was amazing! Great menu and service. If you're ever in Columbus, go to this restaurant! You will not be disappointed. While I was there I even bought a new bathing suit that I totally love. It's a two-piece that meets in the middle and shows just a tiny bit of tummy. Even a year ago, this is not a purchase I could have made because I was incredibly uncomfortable about how I looked and my weight. In recent months, I began loving me as I am, weight and all. At the beginning of the year I was doing Weight Watchers. Then I just didn't want to anymore (I hadn't seen that much weight loss, either). I didn't like tracking points and I couldn't do the core thing. 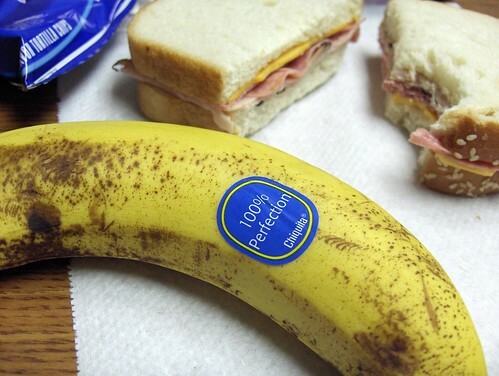 I did take away better eating habits, though. I have continued to eat better than I was and I've even started exercising more. My weight has mostly stayed the same, but my mindset has changed. I've had some fantastic encouragement from Matt that has definitely helped. I've even started buying "girlie shirts" (the ones that are actually shaped and are form fitting!) and that alone is a huge step… just the fact that I feel comfortable in them again is amazing to me. Something I read also helped to change my mindset about appearance and not worrying about it. Amanda wrote this fantastic post that really touched me and summed up how I feel pretty good (aside from the fact that I don't have PCOS, but I do have other problems that make it hard to lose weight). The stress of worrying about my weight and appearance so much just isn't worth it to me anymore. I think that now I care about the way I look and I feel confident about it (most of the time, anyhow – we all have our days! ), rather than being obsessively worried about my weight and what I'm wearing. I think I still have a little way to go with it, but it's a pretty big change for me! A change that I definitely welcome. I also made a visit to Knitters Mercantile. I showed a lot of restraint and only bought two skeins of sock yarn, a set of US 0 needles because I somehow lost my metal set from Knit Picks, a set of US 5 straight needles for my scarf kit, and one of those things that hold your DPN's together (like these here). I really like the store and the staff was very friendly. Notes: This was a pretty simple pattnern to follow and memorize. I got done pretty quickly, but it did take me a long time to block it (didn't do that until June). My Grandma loves it! Saying anything else would be an understatement. She worn it practically the whole time she's been here visiting (she leaves tomorrow). She gets cold pretty easily and she said she's going to replace the store-bought sweater she keeps in the car with the shawl so that she can wear it out anytime she's out somewhere and gets cold, which apparently happens often. I liked working with the Silky Wool. It's only the second time using it. I don't know what I was thinking when I bought it, though, because I bought SIX skeins of the stuff for one shawl. I must have thought it should be a Monster Shawl or something. Now I have three extra skeins that I don't know what to do with. I'm sure I'll think of something! I was just reading this NY Times article about blogging and it made me revisit my thoughts on blogging here, more specifically about how personal to get. I rarely talk much about my personal life here and if you don't know me in real life, you don't know a whole lot about me other than I'm a knitter. Recently I decided that I've fallen in love with gardening, much the way I did with knitting a few years ago. Since then, I've also decided to change up my blog here a bit to include this new love of mine. In doing this, it made me consider how personal to be in this her blog space. This article made me think even more on the subject – how personal should it really get? I also read a thread on Ravelry where some folks discussed how personal they get on their blogs. It's as varied as knitters are. Some post all, some post only knitting, and it seems many post somewhere in-between the two extremes. I've decided that with the other changes to the blog and somewhat because of the new changes I've made to the blog, I'm going to get a bit more personal. Sometimes stories can't be shared unless you get a little personal and in my view, that's what blogging is all about: sharing. We're all here sharing what we know, our own stories and our experiences. It's constantly interesting to me how the internet brings you closer to people you may never have known otherwise. Ahem. Anyhow. Now that I've got that little bit out there, I'll be moving on to talk about the thing that has me spending hours of my time online lately, researching and learning: gardening. I'll start with a story that will give you an idea of when the gardening bug bit me a little and where I am now (not just with gardening, but life in general!). A few years ago, I had a small garden. I was living with the now ex-boyfriend who knew more about gardening than I did and he did a lot of the work. We did start from seed, but then there was a terrible accident where the whole seed planter crashed to the ground and only a few plants were rescued. Though I'm not that experience with seed growing, it did get my feet wet and I know a little about what to expect. I did learn some things from him, but for the most part I just liked having a garden and eating all the fresh tomatoes, peppers, and cucumbers that grew there. I also enjoyed having fresh basil and thyme at the ready. Since then, though, I've longed to grow veggies and herbs again. Last February I moved back "home" to Florence, Kentucky. I got a job in Cincinnati and lived with my family until the ex-boyfriend and I moved into a house in Florence last April. His son joined us in August. Things were the same as they'd always been. I was stressed out a lot. I know a lot of it had to do with my job and working a hectic schedule and having to meet deadlines all the time (not something I was that accustomed to any longer), but there were plenty of other things that stressed me out, too. On a whim, I applied for a job and to my shock, I got it. I started working at the new job in December. During this time, I re-evaluated my life and decided there were some changes that needed to be made. I decided that being with him wasn't where I wanted to be in life and it was time for me to move on. So, I broke up with him. We tried to live together for a while, but that didn't work out so well, and I ended up moving out at the beginning January of this year, back to live with my family for a while so that he could sort out what he wanted to do – stay in the house or not (turns out he decided to stay in the house). In January, I met a wonderful guy – Matt. We started dating and things really took off. Since I was living with my family and he lived a bit far away, we would spend a lot of time together on the weekends. Then, in April of this year, I moved in with Crafty Mands for a while, but rising gas prices and the extra long commute plus the other driving I had to do wasn't working out for me financially. After some talking with Matt, in May we made the decision that I would move in with him. A big step, yes, but one we were definitely ready for. We've been living together for a bit over a month now and things are going really well. All of this leads me back to gardening! I had wanted to plant a garden when I was living at the house with the ex last year, but he'd told me the ground wasn't anywhere near ready to be planted in and that it "just wasn't going to work this year." He also said the ground needed work before anything could be planted and he thought that the soil wouldn't grow anything (I'm not entirely sure why). This year I really wanted to have a garden, but things were a bit out of sorts for a while. I had been eyeing the balcony for a while when I decided I could grow some veggies, herbs and maybe some other plant life. After some encouraging from Matt, this year I'm teaching myself how to garden from containers. I've been reading loads of books, looking up things online, and spending a fair amount of time on MyFolia (you can find my page here). I also have a hanging container with impatiens. I figured I'd start simple with flowers since I don't know much about them yet. I'm hoping I can learn more about different plants and add to what I'm growing eventually. I've been checking out book after book from the library, soaking up all the information I could get on gardening, especially that on veggies and herbs. One that I really enjoyed was Lasagna Gardening for Small Spaces by Patricia Lanza. I really liked the idea of layering the containers to help them grow better, so I've done all my containers in lasagna layers. Everything seems to be doing pretty well right now and growing so fast! I did discover some bugs on the patio tomatoes and I'm trying to figure out how best to get rid of them before it fruits. I have been knitting lately, too. In fact I finished a whole hat in about three days that I declared a loser because the pattern was totally lost in the self-striping of the yarn. I thought about it for three days before frogging it completely. I didn't even bother to take a picture of it. It wasn't pretty, folks – just take my word for it! Since then, I've started a sock working it from the top-down. Took me a while to figure out a pattern, but I finally decided on a cable and stitch pattern combination that worked. We'll see how it turns out and if I like it, I may write it up (that is, of course, if something like what I've got going hasn't been done before!). I'm also working on a new version of the hat I frogged. Same pattern just different yarn that I think will work much better with the pattern. I had this whole blog post typed up. I even did it in my email program so I wouldn't worry about losing it. I made all these changes to the original draft I typed up last Friday, cut and pasted it in a new blog entry on TypePad. I started playing with getting the photos in the post and found that settings had changed and TypePad is now trying to wrap words around my photos. I don't want that, so I try some other things, cutting and pasting this and that. I try and preview the entry and IE blocks the pop-up. I allow pop-ups and that refreshes the webpage. Yes, the webpage that has my draft of my post that isn't saved and I no longer have in my "paste" because I've copied and pasted things since then. I'm starting from my draft from Friday again. Might get a post soon. Maybe when I'm not pissed off that TypePad/IE ate my damn post. Then again it was my fault for cutting and pasting instead of copying like I thought I did.